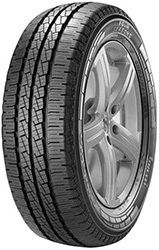 With comfort in mind, the Pirelli Chrono Four Seasons is one of the most comfortable all season van tyres on the market. Providing great handling even with heavy loads and characterised by exceptionally low levels of external noise the tyre will serve you throughout the year and throughout the seasons. Excellent perfomance in both wet and dry conditions combined with reinforced sidewalls all aiming to keep you going for longer and without incident.